The Shamrock! It’s long since been recognized as the symbol of all things Irish. According to legend, this three-leaf member of the clover family was used by St Patrick, the Emerald Isle’s patron saint, to explain the Christian concept of the Holy Trinity to the ancient Celts. Over time, the shamrock has gone beyond its connection to Saint Patrick. It symbolizes Irish heritage and is worn with pride by the Irish and lovers of Ireland alike! 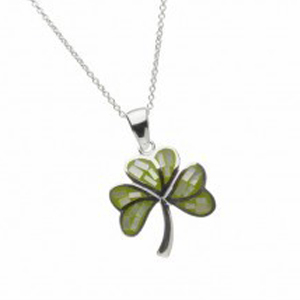 Our Shamrock Jewelry Collection features contemporary, made in Ireland designs of the beautiful shamrock. All are adorned with green stones and Connemara marble for that extra bit of flair. What a great gift idea for anyone with Irish roots! 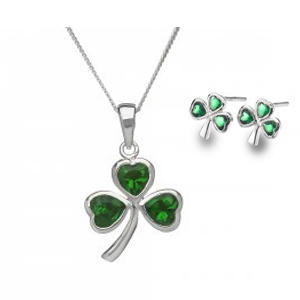 What’s more all pieces of our Shamrock Jewelry Collection ship to anywhere in the world for ONLY $0.99! Let your originality show with this enchanting pair of Shamrock earrings. These earrings feature three glowing retro green stones with a sterling silver base. The ladies who wear these earrings desire to surround themselves with warm feelings of good fortune, and to identify with a strong-willed national sensibility. To finish the look these beautiful earrings can be paired with the Silver Stone set Pendant that is a perfect compliment to them. The shamrock has deep roots in Irish history and culture and combined with the bright green color instantly brings to mind the hundreds of shades of green that blanket the rolling hills of Ireland. This wonderful sterling silver shamrock pendant inlaid with genuine Connemara Marble hangs on an 18” sterling Silver chain. The Shamrock was used by St. Patrick in his sermons to draw a parallel from our earlthy existence to a spriitual life with God. Pointing out the three equally sized leaves he explained the pure and never ending love of the Christian Trinity of God the Father the Son and the Holy Ghost. The addition of the beautiful Connemara green inlay symbolizes revitalization of Spirit and Soul for the wearer. This pendant would be a perfect gift for someone special…or maybe just treat yourself!! 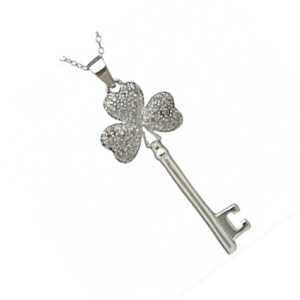 This beautiful Sterling Silver Shamrock “Key Of Ireland” pendant is perfect for any lady who cherishes her Irish descent. This necklace demonstrates her pride for all to see. When wearing this beautiful pendant Ireland is always close at heart, no matter where she may travel in the world. Crafted in Sterling silver it hangs on an 18” sterling silver chain. The shamrock is covered in sparkling cubic zirconia. Assayed and hallmarked for fineness in Dublin Castle. Guaranteed sterling Silver.